February is the “loviest” month, with Hannah’s birthday, my niece Darcie’s birthday, and Valentine’s Day. Lots to celebrate, and this year I felt like we showed the planet a lot more love, too, by keeping the celebrations pretty eco. For Hannah’s birthday, we made our own yummy baked donuts instead of a cake (knowing we were going to have cakes with each of our families in celebration later), and I took her to the library. She got one gift – a tricycle that she should be able to use until she’s 5 or so (with a helmet – I guess that’s kind of two gifts). No wrapping necessary (at this age it’s silly anyway, I suppose). We just gave it to her assembled. She loves it. A fun and low-key day. Valentine’s Day has never been a holiday that is super important to me. I don’t want diamonds, I don’t care about chocolates, and if you get me flowers, get me the kind I can plant in the ground, please. 🙂 So this year we didn’t even exchange cards (except the one Hannah and I made for her dad with scrap paper). I shopped the house for red and pink stuff to decorate the mantle and kitchen shelf. That was the extent of it, and while it felt slightly weird to not really celebrate in any (consumer) way, the day after was so nice because it was over with no guilt. The majority of our household waste before I began this journey, was food and food packaging. Changing the way I grocery shop has made a massive dent in this, to where any garbage generated is very minimal (almost all the kitchen trash generated is from using up pre-zero waste purchases in the pantry and freezer.) Most new garbage is essentially just produce stickers and milk caps (the bottles are returnable but the caps can’t be recycled). As we use up everything bought before zero waste, we have less and less trash each week. Using it all up is a great exercise in patience. I want a zero waste household NOW! But it’s nice to see how far we’ve come in a short time. Made my own tortillas (since they are impossible to find without plastic packaging). Made homemade baked donuts for Hannah’s birthday treat. Got a second-hand bread box for plastic-free bread storage. Bought bagels in my own cloth bag. Bought bamboo utensils to carry when we are out of the house. Valentine’s Day has been a holiday I am mostly neutral about. I like the idea of going out to dinner or getting some flowers, but it’s not a big deal if the extent of celebrating is just something like making up some heart-shaped pancakes or painting my nails red. Whatever. 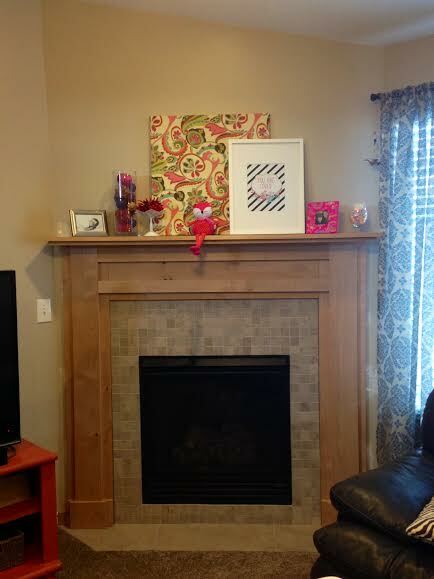 J built the mantel and tiled the fireplace surround in November, and I LOVE it. Such an improvement to our living room. I’ve yet to stain it, but plan to after the 14th, between decor themes. 🙂 For Valentine-y decor, I just rounded up anything and everything pink, red and purple. I printed a free Valentine printable from HERE and framed it in a frame I had in a closet. I pulled a few framed photos from elsewhere (a selfie of me & J and a fave of Hannah as a newborn because ❤ ❤ ❤ ) and there ya go – a lovey-dovey mantel. 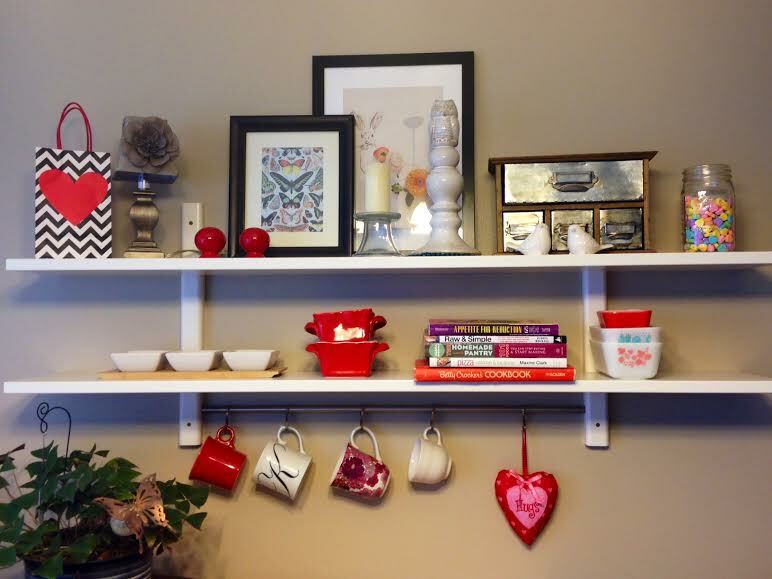 In the eat-in kitchen area I spruced up the trusty IKEA Varde shelf in a similar fashion. I pulled out varies Fiesta Ware, Pyrex and misc mugs of holiday-appropriate colors, added a gift bag from the stash, some conversation hearts in a jar and swapped out the cookbooks for a “new” stack in the right colors. It does the job! We don’t have plans for the holiday yet, but I will probably get some cute pictures of Hannah and the dogs, and make us something festive to eat (like those pancakes..;) ) What do you do for Valentine’s Day?